This Y Combinator-backed startup lets users design their own perfect supplement pill and decide when they want different nutrients released in the body after ingested. First orders are planning to ship next year. Studies such as this one in the Annals of Internal Medicine have shown that many dietary supplement pills are ineffective in treating chronic disease and fending off death, and some vitamins and minerals in high doses may even be dangerous. Along with many others though, the founders of Multiply Labs aren’t ready to close the door on supplements. They believe that inefficacy of vitamin and mineral pills is a result of the pharmaceutical industry’s one-size-fits-all approach. So they’ve created 3D-printed pills with customizable contents. Not entirely unlike the concept behind Bloomizon, another startup in the “custom pill” space, Multiply Labs’ 3D-printed supplement pills allow users to personalize their orders by picking exactly which additional nutrients they would like in their capsule—each capsule contains the full cocktail. Then, Multiply Labs does the rest. Apart from the novelty of designing your own pill, this means not having to buy multiple supplements to cover your daily needs. The process for creating your own perfect supplement pills starts on this page, where customers are asked for basic information such as gender, age, and weight. In the next step, you pick what your main goal is; improvement of general health indicators, energy throughout the day, or workout-specific enhancements. You can choose any combination of those three goals. Finally, you can pick between being shown what kind of pill is recommended based on requirements, or you can manually choose the type and quantity of supplements you want. Multiply Labs’ real ace in the hole is how the capsules behave once they’re inside the body. 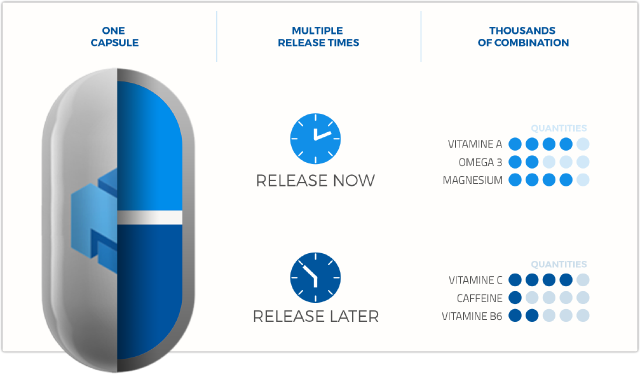 A patent-pending controlled release technology is used to moderate the rate at which each supplement is released once ingested; you can choose which ones are released immediately on consumption and which ones are delivered at a later time. The scheduled release of supplements is achieved by varying the material and thickness of the partitions in the capsule. You can consume a pill first thing in the morning with your vitamins and minerals, but hold off on your caffeine kick (one of the available supplements) until midday. The supplements currently on offer are Vitamin A, Vitamin B1, Vitamin B6, Vitamin B12, Vitamin C, Vitamin D3, Folic Acid, Iron, Selenium, Zinc, Caffeine, and Omega 3. They’re each picked based on peer-reviewed research. More will be added as the debate over effective supplementation continues. With an $82 billion global supplement market ripe for disruption, innovation in the industry has shown a great deal of diversity. Multiply isn’t the only lab in town. Ritual’s sustained release vitamin pills make use of the best nutrients scouted from across the world. Elysium Health trains its focus on cellular health and metabolic repair with its subscription-based dietary supplement pills. NootroBox’s nootropic blends aim to optimize sleep patterns, enhance cognitive function, and boost clarity. Multiply Labs joins a crowded field, but stands out with its time-release technology and use of 3D-printing in the manufacturing process. The startup has raised $120,000 in seed funding from Y Combinator. The funds are being used to produce the first batch of pills, which will ship in 2017. A 15-pill shipment lasting two weeks is available for pre-order at a discounted price of $19 on their website. For just less than the amount of gas I put into my car I can get these custom, time release pills? That is a GREAT deal! At least I wouldn’t feel like 900mg of the 1000mg pills I am taking are going to waste down the toilet. It seems like such a waste to take all sorts of pills when you only need a little of this ingredient and some of that one, so getting a custom built pill seems like the best idea!